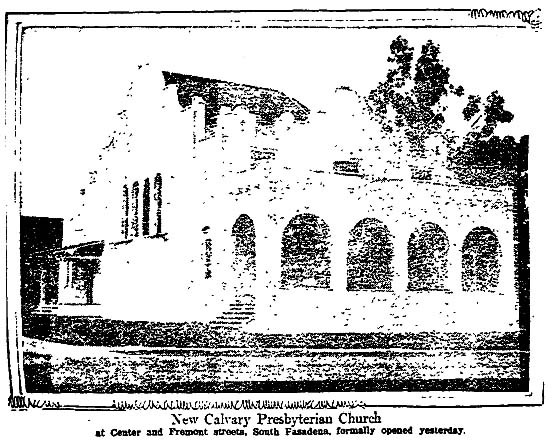 Calvary Presbyterian Church at Center (now El Centro) and Fremont was dedicated in a service featuring prominent local religious leaders, including Dr. John Willis Baer, president of Occidental College. The Times notes that the original church building was located on Columbia Street, but the location was inconvenient, so the church bought the Nazarene Chapel on Center. The church, which cost $10,000 ($205,235.70 USD 2005) incorporates much of the old First Presbyterian Church of Pasadena, which was at Worcester Avenue and Colorado Street, The Times says. < More Mashers	> Crime Wave Sweeps L.A.